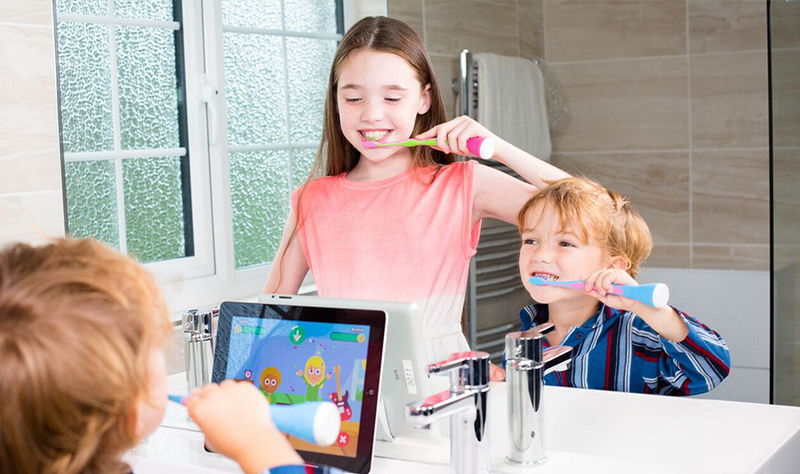 Nimans Home has become the official UK distributor of Playbrush a mobile app that transforms any toothbrush into a video game controller to make the experience of brushing more fun and productive for young children. Playbrush recently starred on the hit BBC show Dragons’ Den but its three entrepreneurs walked away empty handed after failing to agree investment. Now Nimans Home – in partnership with brand development specialists, Kaleidoscope Concepts Ltd – is hoping to smile and leave the Dragons scowling. Playbrush consists of two separate parts. The first is the hardware attachment with a coloured rubber toothbrush holder, which attaches to any manual toothbrush and converts it into a game controller. This connects by Bluetooth to a mobile game that can be played on either a phone or an iPad, which can be attached to a bathroom mirror for ease. There are currently four games to play. Children aged three and above can fight green decay monsters, save the Tooth Fairy, fly planes and even paint pictures. The game is controlled by the movement of the child’s toothbrush and built-in motion sensors measure toothbrushing positions, speed and duration. It even provides brushing feedback. Entrepreneurs Paul Varga, Tolulope Ogunsina and Matthäus Ittner appeared on Dragons’ Den to ask for £100,000 to expand their marketing in Britain for a 1% stake. But they chose to leave with nothing rather than compromise. They have already agreed a corporate branding and licensing agreement with Unilever, allowing them to sell the game with high quality toothbrushes. “This must be one of the most exciting and innovative products to hit the UK for some time,’’ says Rob Parry, Kaleidoscope’s Managing Director.